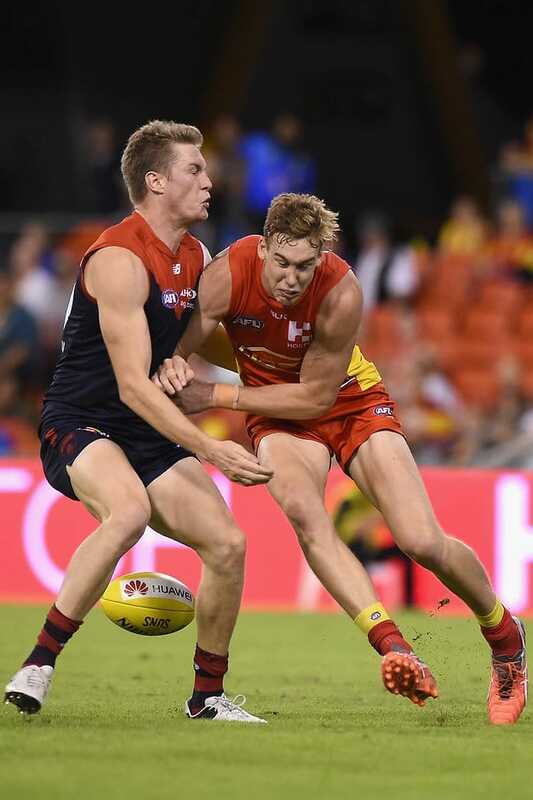 MELBOURNE's 100-game defender Tom McDonald will be assigned the task of stopping star Gold Coast forward Tom Lynch in what Paul Roos describes as a "pivotal" match-up on Sunday. Lynch has been one of the few bright spots in a bleak season for the Suns, with the co-vice captain having booted 55 goals to sit third in the Coleman Medal race. West Coast's Josh Kennedy is first with 58, while the Sydney Swans' Lance Franklin trails the Eagle by one. Roos is confident the 23-year-old is up for the task in his milestone match. "(McDonald's) becoming a really good, competent, consistent defender," Roos said before training on Friday. "He's used to playing on the best players in the competition and generally does pretty well but that's going to be a pivotal battle and one we're hoping to win, because Lynch has been really impressive for them." The two teams met in round seven, when Melbourne was victorious by 73 points at Metricon Stadium. Gold Coast will have a different line-up this time, with Gary Ablett (shoulder) and Dion Prestia (knee) among those missing. However, key defenders Rory Thompson and Steven May will face the Demons after they were absent last time. "Their midfield's very different to the one we faced earlier, (but) their talls are back," Roos said. "It's a chance for Touk Miller, who's a really good young kid. It's a chance for Jack Martin to get in the midfield. (Alex) Sexton's been playing pretty well in there as well." Jack Grimes is among the Demons players in the reserves who have not been able to fight their way back into the senior team. He had 33 disposals with the Casey Scorpions last week after being dropped following the loss to St Kilda. Youngster Clayton Oliver (28 disposals, eight tackles) and half-forward Ben Kennedy (34 disposals, six tackles) were others to impress for Casey. "There's a number of them (in the VFL) that we're really happy with, the way they're playing, and Jack's one of them," Roos said. "We need to make sure, at least verbally, we're rewarding them of their efforts."